We recently tested the device to see what it brings to the table. We give it 8/10. A little over a month into 2019, South Korean tech giant Samsung appears to be making its intentions clear for the year that marks its 10th anniversary of entry into the smartphone business. While the company had been hinting at an aggressive overhaul of its line-up of phones for quite a few months, the decision to take the first steps towards this goal from the Indian market caught many by surprise. Earlier last month, Samsung announced to the world, the Galaxy M20 and M10 smartphones. While the M20 was launched in India on January 28 at a competitive price of Rs 12,990 for the 4GB+64GB variant and Rs 10,990 for the 3GB+32GB variant, the more affordable budget offering M10 was announced at a retail price of Rs 7,990 for the 2GB+16GB variant and Rs 8,990 for the 3GB+32GB variant. Being marketed aggressively in India, the two devices have been positioned for the new-age millennial crowd – most of which currently populates the budget and mid-segment of the market. While on paper, both phones appear to be quite solid offerings from Samsung, it is the M20 that is the more interesting device of the two, and quite frankly is also a better case study in Samsung's attempts at wooing the new age 'millennial' audience which had appeared to be slipping out of its grasp. We recently tested the device to see what it brings to the table. And here's what we found out. Despite the M20 being part of a line-up of phones that heralds a new era for Samsung's mobile phone business, in terms of design, the M20 is more of the same that we saw last year – which to be honest isn't too bad a thing considering Samsung had only recently started bringing elements of its flagship phones to the budget segment. However, despite borrowing core design elements from previous Samsung phones, it does bring a fresh approach because of some key additions. The M20 has been machined out of glass and plastic at the front and the back, with a metallic frame holding together the phone in the middle. 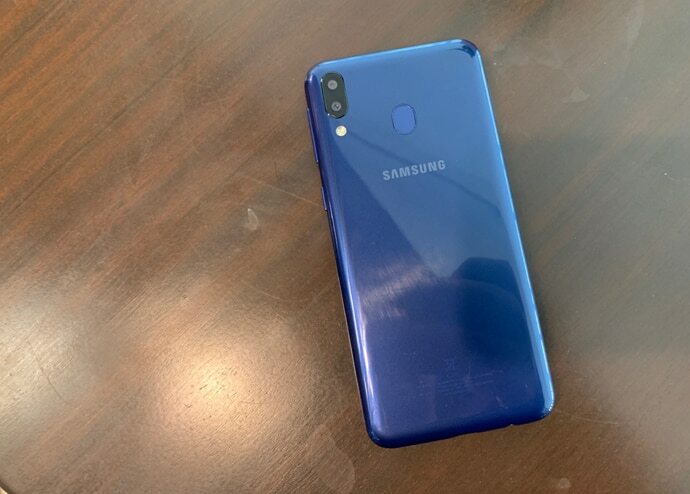 At the back, the phone features a glossy sheet of plastic that is available in two colours – Ocean Blue and Charcoal Black. But to Samsung's credit, it doesn't feel as plasticky as some of the other plastic back devices in the segment. Another interesting thing to note about the device is that despite the use of plastic at the back, the phone doesn't feel like a toy, and has some heft to it. The plastic sheet also holds the phone's pill-shaped fingerprint scanner and dual-camera module and because it curves to meet the display on the front it also holds on its sides the M20 volume rocker, power button as well as the speaker grille, USB-Type C port and a 3.5mm jack. Talking about the display, the 6.3-inch FHD+ Infinity-V panel on the front is an absolute stunner for the price segment, and thanks to the addition of the V-shaped water drop notch makes the phone look more premium than it's price tag. But it's not only in terms of looks that the display excels. As is the case with most Samsung phones, the display on the M20 is quite well calibrated and offers above par brightness as well as good contrast, making it a very good phone to not only stream content on but play games and read e-books too. Another great thing about the M20 is that it meets the Widevine L1 standard that enables it to playback FullHD videos on YouTube and Prime Video. Taking a look at what's under the hood, the first thing that we realised was that this isn't your usual Samsung budget phone – one that despite excelling in terms of build quality and looks, skimps on the core hardware. In fact, core hardware is the one area that Samsung definitely appears to be targeting to impress on. But does it do so? Well, yes and no. Considering Samsung set the bar really low with its 2018 range of budget smartphones that even featured underpowered chipsets such the Snapdragon 450, the use of the Exynos 7904 SoC – a chipset designed in India and tailored for the country's millions of mid-range smartphone buyers – to power the Galaxy M20 is definitely a step in the right direction. Unveiled earlier this month as a chipset that promises to deliver "enhanced multimedia, imaging performance and seamless mobile computing and gaming experiences", the Exynos 7904 – thanks to its two performance Cortex-A73 cores running at 1.8GHz for heavy computational tasks, and six energy efficient Cortex A53 cores running at 1.6GHz for everyday tasks – provides vastly improved performance than what we saw in the previous generation of budget phones from Samsung. But despite being a welcome upgrade on chipsets such as the Exynos 7870 and the Snapdragon 450, it just does about enough to stay in the race with smartphones running Qualcomm's more powerful chipsets such as the 636 and 660 SoC. The phone's GPU too – the Mali G71-MP2 – also ends up falling behind the Adreno 509 and 512 GPU found on competing phones in the market. But as we found out during our time with the phone, it cannot be denied that the Exynos 7904 architecture paired with up to 4GB RAM and 64GB ROM – tasked to run Android 8.1 Oreo with Experience UI 9.5 on top for now – does give the M20 enough power to tackle the needs of most 'millennial' users looking for devices for browsing the net, staying in touch with the world of social media, and play games on at decent graphical settings – all while remaining extremely power efficient. 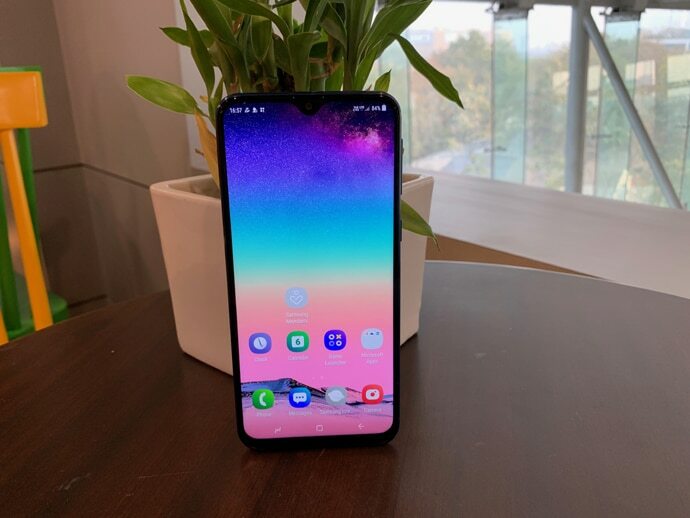 Coming to the cameras, the Galaxy M20 is a phone that despite not being the best camera-phone in the segment proves to be the one with the most unique one. The M20 brings with it a 13-Megapixel primary sensor on the back with f/1.9 aperture and a secondary 5-megapixel ultra wide-angle sensor with f/2.2 aperture, making it the only in the segment to offer such a set-up. Much like the A9 and A7 devices from 2018, the wide angle lens on the device helps capture wider area in a frame. In our time with the device, this proved to be a smooth affair, with a tap of a button switching us between wide and regular shots. However, the quality of the pictures did leave us wanting for more. In the shots we clicked, colour accuracy remained an issue. But this we suspect is a fault of the operating system, that would most likely be fixed soon by Samsung via an update. 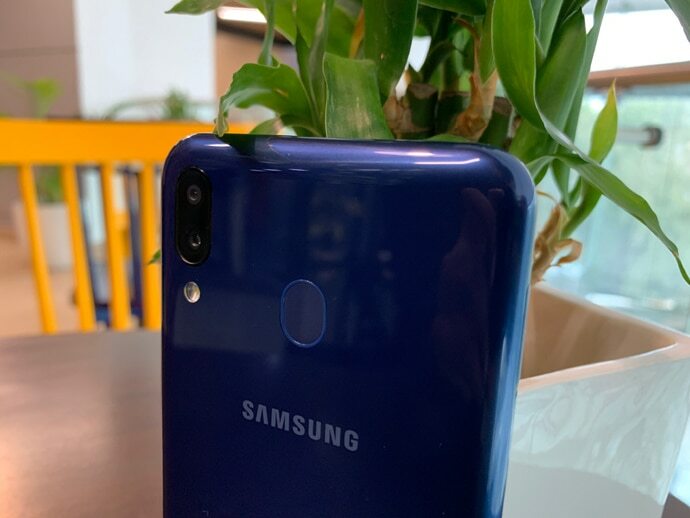 On the front of the phone, Samsung has used an eight-megapixel selfie camera that excels by bringing with itself flagship features such as Live Focus but falters a little at the basic. Selfies clicked by us turned out to be a little over-softened, and clicked noisy pictures under low light. The front camera also enables Samsung to bring a pretty fast face unlock feature to the device. This is another area where the M20 excels. The phone brings with it a massive 5,000mAh battery, which is not only an upgrade on the battery packs that previous budget Samsung phones brought with them, but is also substantially more than what the current flagships such as S9 and the Note 9 offer. As such, it came as no surprise when during our time with the M20, the phone just refused to die on us because of lack of charge. We easily got close to two days of usage on a single charge that too after putting the phone through the normal grind of videos, games and lots of calls. Samsung has also added fast charging capability to the phone and is also bundling a 15W charger in the box that tops up the 5000mAh battery in a little less than two hours. So is the Galaxy M20 the best you can buy in the segment? To be honest, the answer to that lies in what you seek from your phone. 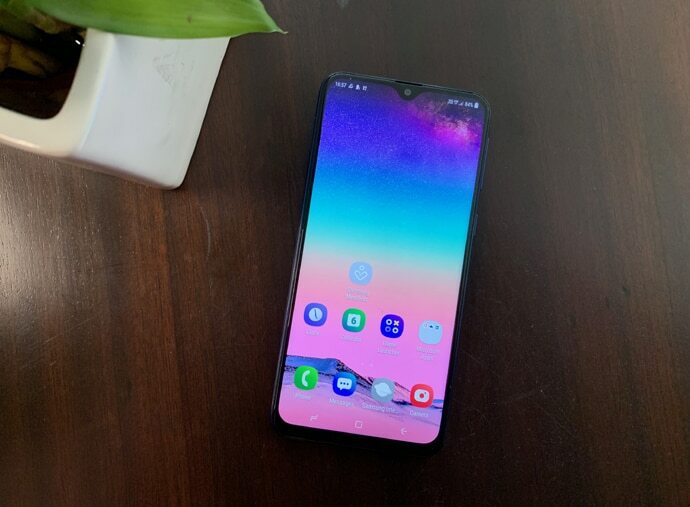 For an average user who's looking for a phone with a beautiful display and above par performance the phone does make a very solid argument for itself. For all day-to-day tasks, the M20 proves to be quite good enough. Its wide angle lens equipped camera setup and the massive battery impresses too. However, it's still not the ultimate phone for the millennial audience. But that's not for a lack of trying on the part of Samsung, but rather a consequence of the wide-ranging needs of this segment of buyers. And that's something which no smartphone maker in the price segment can fix. On the balance of things, the Galaxy m20 does everything just about right which ends up being a solid above-par performer that you can buy for as low as Rs 10,990. And that is its biggest achievement.